In 2004 the Kona Cap was created by accident. A talented craftsman who has been creating since he was a child made the first Kona Cap from a (scrap) piece of koa wood left over from a custom furniture job on Oahu. The bill was not bendable, and soon after making more saw dust, and playing with wood finishes and adjusting the thickness of wood, the bill became bendable! Soon all family and friends had a cap, and the demand grew. So we started making the Kona Caps in our garage after working all day making saw dust for someone else! 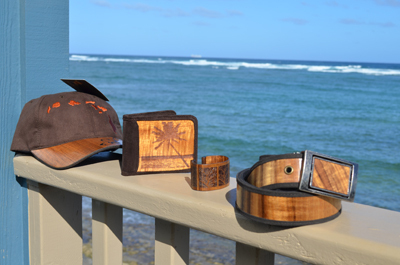 Now the products have exploded into other wearable woods to include the bendable wood wallet, belt, and wood cuff. As well as many other items that can be custom made.